"The lesson of Christmas and St Stephen is a lesson of sacrifice, but what is the way we can be able to live it?" We publish Fr. Luigi Giussani's homily on the Feast of Saint Stephen, 1944. Article published in First Things about the joy of Christmas. "Christmas is beautiful, it is joyful [...] It speaks to everyone’s desire to be happy, and [...] that their happiness cannot be manufactured, it can only be given as a gift." "This is a time when the doors of the churches are wide open for everybody, not only for the faithful, but also for those who are seeking the Mystery." After being devastated by a bomb, the Church of St. Francis in Aleppo opens its doors to the needy. On December 8, 2015, His Holiness Pope Francis kicked off the Extraordinary Jubilee of Mercy in St. Peter's Square. We publish his homily that day. Aura Miguel, a Vatican correspondent for Lisbon’s Rádio Renascença, accompanied Francis in his visit to Uganda, Kenya and the Central African Republic. In this interview she offers a reflection on what she experienced during those days. The following is the question and answer session following Fr. Carrón’s remarks at the University of Notre Dame, November 21, 2015. "If the faith is truly lived seriously, it is able to meet all the desire of fullness that a person desires when not finding another." We publish an interview with Julián Carrón in light of ten years as head of Communion and Liberation. Fr. Ibrahim sends a letter after the Cathedral of Aleppo was attacked by jihadists. "... We were in fact, protected under the mantle of our heavenly mother Mary." During his US trip, we heard Pope Francis give a powerful plea to our nation on behalf of refugees, urging us not to be taken aback by the great numbers but to always treat displaced people as human beings. The Dadaab refugee camp is the world’s largest, and at its center there is a black hole: the future. Even so, Maria Leitao works here to educate young people to be film directors. Here, where “human hope is non existent,” something is happening. A video on the Pope's visit to the United States and Cuba. "Friar Junípero’s witness calls upon us to get involved, personally, in the mission to the whole continent." In light of the canonization of Father Junípero Serra, we publish an overview of his life, his call to mission and his canonization. 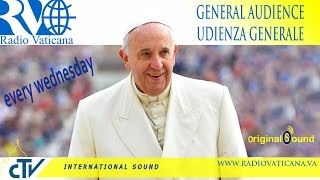 General Audience: Why have a Jubilee of Mercy? A day after the opening of the Holy Door of the Jubilee of Mercy in St. Peter's, Pope Francis reflects on the meaning of the upcoming Holy Year. Fr. Julián Carrón shared a message with the CLU pilgrims as they departed for their journey to Our Lady of Good Help. "Only those who have been caressed by the tenderness of mercy truly know the Lord." We publish the address of the Holy Father Francis to the Movement of Communion and Liberation in Saint Peter’s Square on the tenth anniversary of Msgr. Giussani's passing. Recovering wonder at “the gift of creation”: the only way to recover our sense of personal responsibility. Amidst the pages of Laudato Si’, Fr. Paolo Martinelli, Capuchin and Auxiliary Bishop of Milan, finds a call to holiness.